Why? : "Toohey's... it's an Australian beer. When I was in the Marine Corps., the first day I was stationed in Australia we went to go visit the Hard Rock Cafe in Sydney. I went up to the bar and asked the bar tender what a good Australian beer was, and he poured me a Toohey's. It's like... a lager... the closest beer I can compare it to... it was kind of like a Heineken. It doesn't get you too drunk, it's just right." Why? : "I'm busy. Go bother David." Why? : "A good buddy of mine at work named James recommended me a really good beer called Victory At Sea. It's a coffee Vanilla Imperial Porter. It's got 10% alcohol too. Super smooth, you pretty much only need one. It's a good beer to relax with. Never had a beer like that before, I highly recommend it." Tiny Planet is an app that rotates your panoramic photos edge-to-edge so that they have a tiny, planet-like appearance. Here's the main image I'll be using for my first try, I took a picture of the World's Largest Thermometer while passing through Baker CA. on the way to Vegas. They should just change that to permanently say: "Too ******* Hot." Once my image is selected, I have three choices... Tiny Planet on the left, Rabbit Hole in the middle, and Video Planet on the right. Selecting "Tiny Planet" rotates the inside of your image clockwise. I tried several landscape/panorama images and the ones that seemed to work the best were ones where the sides of the shot were empty/simple. If there are large, elongated objects on the sides of your image, you won't get that floating/circular planet like appearance. For images that fall into this category, you can try using the Rabbit Hole feature, which rotates the inside of your image outwardly, giving it an Inception/Alice In Wonderland other-worldly vibe. Lastly, Video Planet animates your photo so that it alternates in-between the Tiny Planet and Rabbit Hole filter. Once your circular filter has been applied, you now have the choice of emailing or posting it on social media. For an additional $0.99, you can unlock Tiny Planet's "Extras Pack" that offer several different tools and video filters for your images. So What was my overall impression of Tiny Planet? Tiny Planet delivers on the overall premise of a fun photo app. It's simple, easy to use, and enjoyable. While the overall use of the app might be limited, I feel the concept of transforming your panoramic images into a square/planet like images is great for 2 reasons. The first is that if you're original image is a very long panorama, besides a computer/mobile screen, you're not going to have many display options outside of a custom print. Tiny Planet condenses your image in a unique way where it's transformed into more print friendly dimensions. The second is that for the most part, your image retains all of it's detail. While imagery on the side might get squished or overlap at the fold, you can follow the swirl and still enjoy the secenery of your image. While the "extras pack" is a nice touch should you feel inclined to edit your image further, for me, it felt a little unnecessary since the rotating filter alters your original image so heavily, minor fixes/touches would probably go unnoticed. While I'm sure there's some sort of unwritten rules that exist about what beers you're supposed to drink on St Patricks Day, that means absolutely nothing to most people who celebrate it as an excuse to get wasted. For those of you who want to enjoy the nature of the holiday without having to squeeze in-between 20 sweaty, shirtless guys, butchering a Dropkick Murphy's song, we've decided to step in and make a couple of beer suggestions. Why? : "That's my favorite beer. It was one of the first beers I've had where it wasn't like... a Corona. It's an expensive beer.... so it's a good beer. You drink it out of these glasses that they have... they're kind of like a wine glass almost? (Goblet?) Yeah, that's how you drink Chimay. It's a dark beer and it's really strong, especially if you drink the whole bottle.... which I usually do." Why? : "We went to 4 local craft breweries around town, for my birthday, with some friends and I. Not that this area is super well known for it's craft breweries... but I was surprised. It's a passion that everyone is starting to get into now. You got these people that are like these real beer nerds, and they really get into it, they're really into their product. Where as the other ones are trying to make a 'really happenin'' place to go to. I think there's room for both, but depending on who you're with. I think who you drink the beer with makes it taste much better. There's this place, right around the corner from us, called Euryale. These guys were awesome. These were thee beer nerds I was speaking of in particular. They had this one that had notes of whiskey. Whiskey and a little fruit, it was awesome. Why? : "I'd recently sworn of all alcohol... until I learned alcoholic root beer was a thing. I had to check this out. There's a couple out there, they taste like root beer for a few seconds, followed by a swift bitter taste. Those freak me out, it tastes too good. That's why I like the Hard Root Beer from Mission Brewery. Right off the bat, there's no confusion here, this IS alcohol. Sure, there's a strong hint of root beer, but it's also got this tangy, malt-liquor-esque taste. I basically showed up to my local BevMo each week and tried the different hard root beers they had until I came across this one. Out of all the ones I tried. This one was the least sweetest, but it also tasted the best. I highly recommend drinking this wile eating pizza." This entry was posted in Uncategorized and tagged beer on March 7, 2016 by admin. As a principled company, PLYWERK adhere's to strong moral business practices. First of all, we only use sustainable, eco-friendly materials in our production process. Secondly, we've strongly commitment to powering our day-to-day operation with 100% clean solar energy, but it doesn't stop there. There's a third and equally important step that we're excited to discuss, and that's the donation of our leftover wood materials. After all the cutting, sanding, and printing, what's usually left over are random mismatched pieces of wood varying in sized condition. While most people would normally just chuck all of this scrap in the trash, we started scratching our heads with new ways to create a use for these left over pieces of wood. Many of our left over scarp are full sheets of plywood with a litany of squares cut out that we use to fashion our wood canvases. These large structures are donated to our local Habitat for Humanity, a charity organization that builds homes for those in need. Habitat for Humanity uses the oversized scraps as trellis' for their gardening projects, and whatever cannot be used is sold by the organization so that the money gained can help even further. On a smaller scale, given our passion for creativity, smaller, manageable sized pieces of scrap wood are sometimes donated to artists. These makeshift wooden canvases are not only wonderful for established artists, but for growing ones as well, that's why we also donate these pieces to local elementary schools for their students to use. While we've discovered these new and exciting ways to repurpose our left over pieces of wood so that nothing goes to waste, we're always on the lookout for new avenues and causes in need of donations. For those interested, feel free to contact us and we'll gladly work with you in our on going effort to operate responsibly as an eco-concise business. If you've been following the online chatter you may have already heard that another entrepreneurial couple are purchasing the Plywerk intangible assets (brand, website, etc). Derric and Erin Swinfard, owners of Printsonwood.com, have agreed to take over where Kjell and Kim left off. Given that Kjell and Kim were willing to simply close the doors and move on it’s really a dream come true to get a call from Derric, who is essentially a competitor, saying “You guys can't do this! I love what you guys do and I love your products!" Plywerk Inc will still be still closing it’s doors in the new year. Prints On Wood will be incorporating the production of the Plywerk products into their existing business and production facility near LA. Plywerk will now be produced with 100% solar power since the Prints On Wood building has 200 solar panels on its roof! Plywerk Inc. will still be fulfilling all orders placed through Jan 8th here in Portland. All orders placed on or after Jan 9th will be fulfilled by Prints On Wood. Printsonwood.com will incorperate their direct printing process into the Plywerk site, this means they will no longer be mounting photographs but instead printing directly onto the panels. During the transition some of the Plywerk crew will be flying down to work alongside the Prints On Wood crew to help facilitate a smooth transition and to ensure that the high standards of quality you’ve come to expect from Plywerk is upheld by Prints On Wood. Kjell, in his new career as a lean efficiency consultant focused on small U.S. based manufacturers (www.vanzoen.com), will be working with Derric to ensure that Prints On Wood’s existing operation (and integrating Plywerk into it) benefits from all that Kjell has learned during his last 10 years at Plywerk. And most importantly Techno Kitten will continue to dominate Plywerk.com’s footer! Kjell and Kim are more than happy to see the brand continue under someone else's leadership but sad to see it leave Portland. We’d like to thank you all for supporting their vision for sustainable US manufacturing. 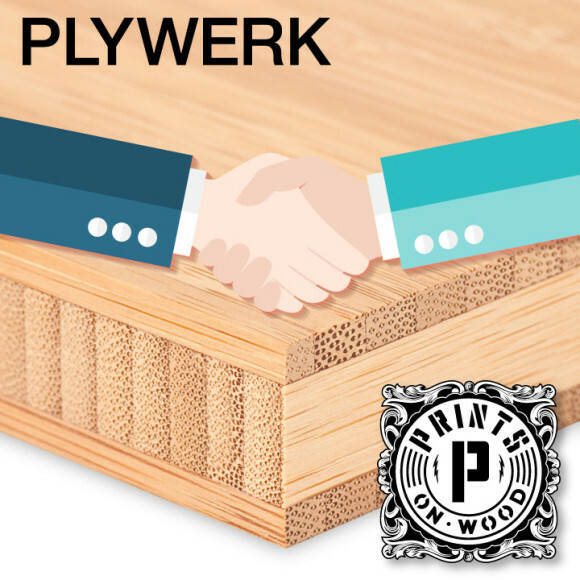 We hope you can be proud that this vision will live on with Prints on Wood at the helm of the Plywerk brand. Co-Founder & CEO of Plywerk Inc. Founder & CEO of Monster Media Inc.
Plywerk.com is going to continue! After months of looking for someone to pass the Plywerk torch to, we finally decided to call it good and move along. The other day, we published that news and heartfelt sentiment in an earlier post. The very next day, we got word that there is someone interested in continuing where we left off. Oh, Happy Days!! Meet Prints on Wood, a friendly competitor for many years who shares our commitment to sustainability, superior quality, and a responsible business ethos in general. It's safe to say Prints on Wood is one of the good guys! The details are still being sorted out, but the important thing to know is that Plywerk.com will continue and you'll still be able to Plywerk your memories on the sleekest, sexiest, straight-up-bestest bamboo panels around. We'll keep you posted! In the meantime, eat cantaloupe, drink nog, and be merry. UPDATE - Dec 8th 2015: Plywerk.com is going to continue! It is with a heavy heart that I write to inform you that as of Jan 31st 2016 Plywerk Inc. will be ceasing all operations. We plan to take orders through Sunday December 20th but once those orders have been completed and mailed we’ll be closing down operations and intend to be out of our space by January 31st. We are talking to some other businesses who may be interested in the name, website, etc. so there is a chance that the products may continue to be sold under someone else’s leadership. Kim and I started selling her photos mounted on maple panels almost 10 years ago. Since that time we feel very fortunate to have had the opportunity to grow that idea from our basement studio into a business occupying 3,000 sq ft, employing over 40 people in the Portland area, and providing over 40,000 Plywerk products to happy customers all over the world. We were the first to market with images mounted on bamboo but since 2010 we’ve seen an increasing number of competitors enter the market. This led us to implement lean manufacturing as a way to reduce costs while maintaining (and often increasing) quality. As competition grew, we managed to differentiate ourselves through superior quality, tip-top customer service, support for artists and photographers, and an unrelenting commitment to a triple-bottom-line (people, planet and profit) operating philosophy, culminating in the writing of our Plywerk Manifesto, published earlier this year. In recent years, we’ve also sought to broaden our reach by developing innovative new products such as Maggie, Stanley and Vinny, focusing on simple design and using sustainable, local woods, with the hopes that a stronger retail presence with these products would give us the sales we needed. Alas, all these attempts to maintain and grow our market position have not produced the sales needed to sustain positive cash-flow, and after many months of struggling to overcome this reality, the time came for this decision to be made. Success can be measured in many ways. Kim and I have dedicated the past 10 years of our lives to making Plywerk the success it is, but as any business owner will tell you it’s not an easy journey, and in the end cash is always king. So although I am saddened by the circumstances under which Plywerk is coming to an end, I feel that myself, Kim, and the rest of the Plywerk team gave it our best shot and are all proud of what we achieved. A big personal thank you to all the employees, customers, vendors, lenders and friends who supported me and Kim in our endeavour. Should have any further questions or concerns please do feel free to reach out to us. PS Should have any further questions or concerns please feel free to reach out to us and we'd be happy to talk with you. Get ‘em while they’re hot: the It’s Too Damn Hot Frame Sale is on! It’s. So. Hot. No, seriously: I’m writing this at 9:30 PM from an air-conditioned bar in Southeast and I’m still too hot. With temperatures like these, it makes coming up with creative marketing ideas really difficult. So instead, we’re just going to offer a blanket 20% discount on all Plywerk picture display products. Boring? Sure, but it's too hot to think of a better idea for a picture frame sale. Just head over to our eco-friendly online store and use discount code TOOHOT20 to instantly save on all photo display products, now through August 24th. Yes, we know, this is one of the least inspired promotions of the summer, but c’mon, what do you really expect? It’s really, really hot. There have been multiple days of 100+ degree weather here in Portland, and we just don’t know how to function in that kind of heat. The only thing we know how to do is offer incredibly steep savings on the world’s best photo and art mounting solutions, like our custom prints on Plywerk. We also have great do-it-yourself picture frames and photo stands, like our Stanley and Maggie, and you can save 20% on them, too. Did you know that the bamboo used in our panels is some of the best stuff on earth for capturing carbon emissions? That’s worth talking about at at a time like this when the world is experiencing record high temperatures. Support the international bamboo growing community by purchasing Plywerk, and maybe we can help lower the mercury back down to tolerable levels. Or just do it because it’s 20% off right now. Oh yeah, we’re also doing this cool thing were you get a free Bamboo Coaster with your order, atop which you can rest your cold beverage of choice. Iced tea, IPA, lemonade, it doesn’t really matter. Just make it cold. Any cold drink would be great right now, actually. There’s an idea: buy Plywerk, contribute to our Cold Drink Fund. We appreciate it. So remember, just use discount code TOOHOT20 to instantly save 20% on your next Plywerk order. The original version of this article, Tech Tips: Basic Portrait Photography, was published at the Pro Photo Supply News Desk. We all know the number one reason people take pictures is to show the world their food. But, second to that, people want to take pictures of other people: friends, family, loved ones, celebrities, ghostly apparitions, you name it. So here are 3 super easy portrait photography tips to help you get the most out of your next portrait session... or selfie. Canon 5DS R with Zeiss 55mm f/1.4 lens. Photo: Daven Mathies.